Been diving in HMAS Swan? Please Vote! 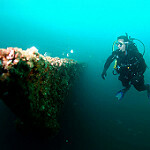 The HMAS Swan, a world renown purposively created dive site, is one of Australia’s most popular wreck dives. Not only is the ship wreck one of the largest accessible ship wrecks in the Southern Hemisphere, it was also the first ship sunk on purpose in the Southern Hemisphere. A naval destroyer in a past life, the 113-metre ship, was retired, gutted, and then sunk in 1997. It is located off the coast of Dunsborough, 200 km south of Perth. 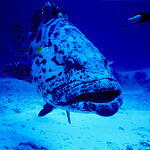 As it lies in the Indian Ocean, visibility is fantastic averaging around 20 metres and can reach 25 metres. 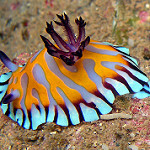 At a minimum depth of 9 metres, and a maximum depth of 35 metres, large quantities of ocean life have taken residence in the HMAS Swan. 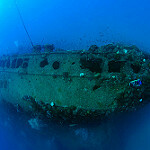 Most of the wreck is covered in algae and every year the sponge growth increases, adding colour to the wreck. 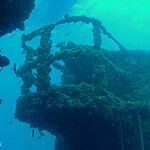 Huge groups of Bullseyes have taken over the many rooms of the wreck. Batfish, Samson fish, and Cowfish and sometimes even a Goliath grouper are easily found lurking in the hull of the ship. Blue devil and sweep fish are a normal sighting as are King George whiting. The wreck has even been known to draw the odd hammerhead shark. Map of Australia, HMAS Swan dive site.